I have been guiding bow hunters for the past 22 years and usually do an average of 20 hunters per season. The average hunters over the past 22 years has shot 7 animals per safari… that means 140 animals per season x 22 years… my math isn’t so good – but that’s a lot of animals. I have seen various broadheads perform (and not perform) on animals as varied in size from steenbuck to buffalo and giraffe and thus feel entitled to some opinion on the matter of broadheads and hunting arrow weights. I am no tech wizard and I’m not going to debate the technical issues, they don’t mean much to me as an outfitter. What means a lot to me though, is how effective the equipment is in killing and animal quickly and cleanly. In all the textbooks (I haven’t read them!) I don’t believe there is much reference to “bone deflection”. This is so common, even with the heavier arrows, that I am astounded it isn’t covered more by bow hunting journalists. If a quartering away shot is taken with a light arrow on almost any African game bigger than an impala, and it strikes the ribs or shoulder, that arrow usually runs along the outside of the rib cage, under the shoulder, and may exit in front of the chest or in the neck of the animal. The client thinks he has made a great shot and got good penetration, but then is surprised that the animal isn’t lying dead within a hundred yards. What means a lot to me though, is how effective the equipment is in killing and animal quickly and cleanly. The reality is usually that the animal is not dead and is 1000 yards away and still going! So many times a client thinks that he has made a perfect shot… and he has, but the arrow deflected off the bone on entry and unknown to him, has exited through the gut just in front of the hind leg! 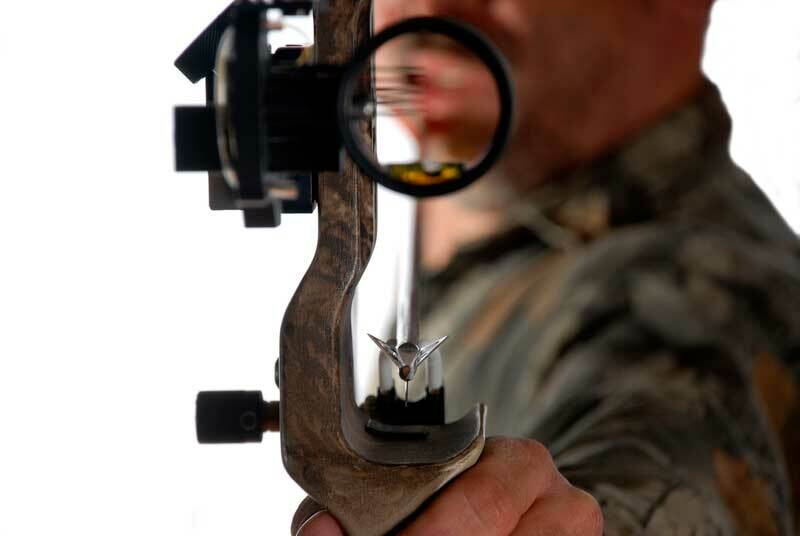 That is because one side of the broadhead struck rib or shoulder on entry and deflected the arrow through the body. It’s too quick for the eye to see and the opposite side is usually not visible to the hunter to see the exit. This is especially true of hunters using fast and light arrows. The heavier the arrow the less likely will be deflection. So no matter what weight you are pulling, use the heaviest arrows and broadheads you are comfortable with. I would rather be struck by a straw travelling at 500 fps than a spear travelling at 30 fps… same with arrows.